Home » World » Europe » Russia Developing Guns to Turn People to Zombies! Russia Developing Guns to Turn People to Zombies! 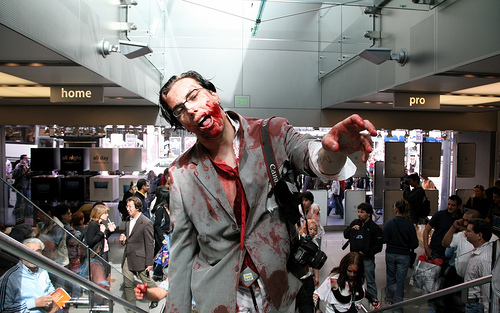 The Russians are developing a secret weapon that will turn people into Zombies, literally! There isn’t really much information about where the weapon is being made only some shady comments by Russia’s defense minister which tells us it is not a happy story. “We know very little about this weapon, and even special forces guys can hardly cope with it,” added Serdyukov. That doesn’t sound very comforting. While this technology is certainly disturbing, thankfully, it’s unlikely to be the cause of the inevitable zombie apocalypse. Victims of the gun don’t — as far as we know — develop a taste for human brains. And since the zombie effect isn’t viral, those dissidents won’t be able to go around turning other people into the restless undead. Phew. Dominique Strauss-Kahn Resigns as IMF Chief! Previous: Texts From Hillary – Is Hillary Running the World ? Next: How to avoid secondhand smoke?